This finial made of thickly gilt silver was probably a terminal from one of the poles supporting a palanquin or howdah. Its decoration identifies it as having been made for Tipu Sultan (r.1782-1799) the Muslim ruler of Mysore in South India. 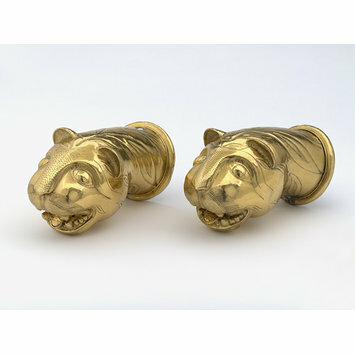 Artefacts made for him personally were decorated with tiger motifs and tiger stripes. Although the use of a tiger head in the decoration of courtly objects was by no means confined to his court, the precise form of the stripes on this finial, the shape of the eye, and the scale of the stripes in relation to the head, all compare closely with other artefacts made for the ruler, notably his mechanical tiger which is also in the V&A (IS.2545). Tipu Sultan's treasury was seized by the British when they defeated the Mysore army at the Siege of Seringapatam in 1799, and divided between the victorious troops. Much of it was immediately resold, and anything made of silver or gold was probably melted down. Although any documentation that may have linked this piece directly with Tipu Sultan has been lost, its origins are apparent from its design. The circumstances under which his treasury was broken up make it very likely that it was taken at the 1799 siege. Palanquins were the litters used when travelling, the poles used by the bearers to carry the palanquin. 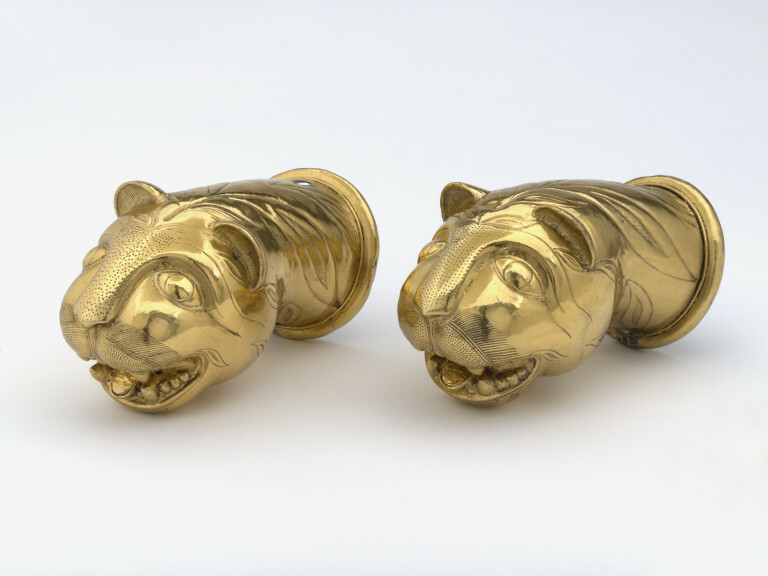 The gilt pole-ends are in the form of tigers-heads.The shape of the eyes and the scale of the stripes in relation to the head are closely similar to those of Tipu Sultan's wooden tiger. Unknown because the original number is lost. The decoration, however, indicates that this and its companion were made for Tipu Sultan.